Goldman Sachs reaches $5 billion settlement for mortgage-backed securities. 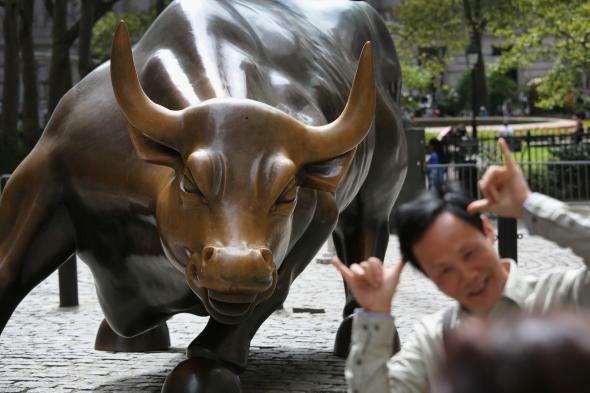 Tourists pose in front of the Wall Street Bull near the New York Stock Exchange on September 16, 2013 in New York City. Goldman Sachs announced Thursday it had reached a $5 billion settlement with federal and state regulators over its packaging, marketing, and sale of toxic mortgage-backed securities that helped fuel the financial crisis in 2008. The regulatory penalty is the largest in the bank’s history, but is much smaller than other banks: Bank of America paid $16.6 billion and JPMorgan Chase paid about $13 billion in 2013 in similar settlements to investigations into whether they deliberately misled customers about the quality of the individual loans in the mortgage-backed securities.